Warner Bros is negotiating to acquire the big screen rights to Attack on Titan, for a U.S. remake that will be shepherded by Fantastic Beasts and Where to Find Them producer David Heyman. It isn't clear how far along these negotiations are, or if the studio is eyeing a director and/or screenwriter to bring this project to life quite yet. The studio has previously tried to bring the iconic manga Akira to the big screen, but that adaptation languished over a number of years. It remains to be seen if this film will move forward with more speed and efficiency. Deadline reports that the movie will be an adaptation of the two-part Japanese manga adaptation that debuted in 2015. The first movie earned $25.7 million in Japan, although the second movie dropped significantly, earning just $13.2 million, hitting theaters just one month later. Both films were released in the U.S. through Funimation, but the first movie only earned $449,523 in the U.S., while the second pulled in $305,934 stateside. Attack on Titan is set 100 years after the sudden arrival of the Titans, mysterious, gigantic humanoid creatures who devour human beings one after the other, which brought mankind to the brink of extinction. The remnants of the human population now live in relative peace behind massive walls that were erected to defend themselves against the Titans. Yet once again, that peace is shattered when a Titan measuring over 50 meters tall smashes through the wall, allowing a horde of other Titans to enter. The story follows Eren, who joins the "Outer Wall Restoration Team" that reunites him with a childhood friend named Misaka, as they try to find explosives and get back in time to fix the wall before more Titans come through. 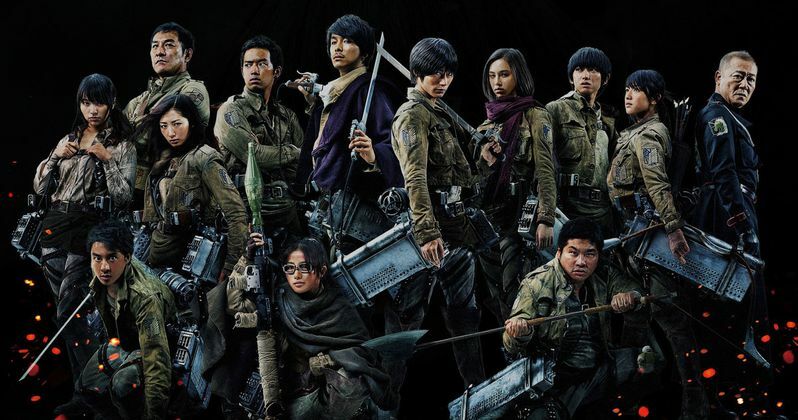 Attack on Titan is based on the original manga novel by Hajime Isayama, with the two-part movie starring Haruma Miura as Eren Yeager, Kiko Mizuhara as Misaka Ackerman, Kanata Hongo as Armin Arlert, who all join the Survey Corps to battle the Titans, after Eren's mother passes away following a Titan breaching the walls. The supporting cast is rounded out by Kanata Hongo, Satomi Ishihara, Nanami Sakuraba, Takahiro Miura, Ayame Misaki, Pierre Taki and Jun Kunimura. The two-part movie was directed by Shinji Higuchi from an adapted script by Yuusuke Watanabe and Tomohiro Machiyama. Producer David Heyman is coming off the global blockbuster Fantastic Beasts and Where to Find Them, which just recently passed the $800 million worldwide milestone. He will also return to produce the four sequels that will follow. He is also producing other projects such as Paddington 2, A Boy and His Shoe and The Nephilim. Hopefully we'll find out more about who will be writing, directing and starring in the Attack on Titan remake soon.